and healthy ideas to drive success. 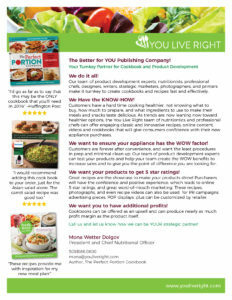 The YLR team are experts in the science and nutrition of food to create balanced recipes, cookbooks and guides, meal plans, tips, and wellness programs to drive healthful changes. We have expertise in creating recipes that can satisfy health needs. We take nutritional scientific research and transform it to to relevant and useable consumer-friendly tips, guides and recipes that are simple, engaging and fun. Food is an amazing tool to promote health, and our goal is to drive success for positive lifestyle change. Our team of chefs and nutritionists have the expertise and creative MAGIC to create fun, simple and healthy recipes and meal plans. We think about the recipes, as well as the the entire cooking process, from number and availability of ingredients, economic cost, shopping list creation, prep and cook time, serving sizes and amounts, and even clean-up time! 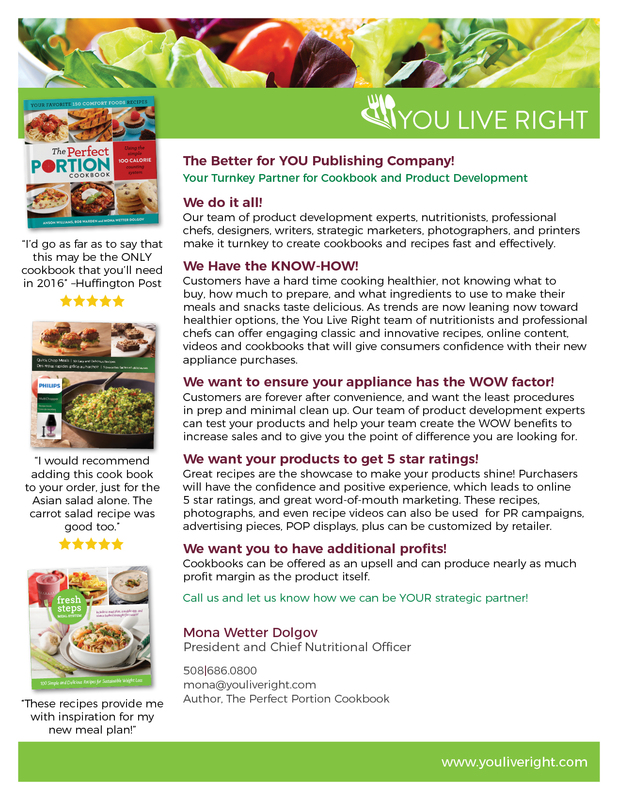 We have created and published over 30 5-star rated cookbooks and developed hundreds of recipes for top kitchen appliances, food companies, health and wellness companies, medical practices, and supermarket retailers. Our eyes are always on creating healthier, nutritious recipes and plans that are delicious and easy to follow—our goal is to create the “all-time” favorites! The YLR team studies food trends and listens to the consumer to understand the daily lifestyle challenges with the entire prep and cooking experience. habits We have expertise in understanding different consumer targets to understand the different “nuggets” of consumer insight to drive success and promote healthful change. Our goal is to create an integrated way to make it easy and exciting, and to promote inspiration and motivation to lead a healthier lifestyle. This can be in the form of print materials, books, digital content, social media, and/or recipe videos. We also can form alliances with food and food-related companies, chefs, and food bloggers to create exciting marketing programs. To improve the eating habits of Americans by engaging consumers to food in a fun and inspirational way. Healthier eating CAN be simple and delicious, and it is our mission to create the WOW and amazement of getting there! Our team is a unique combination of nutritionists, chefs, and marketers to make this magic happen! We work with food companies, food retailers, appliance companies, and health and wellness firms to develop integrated programs, including delicious recipes and guides/tips, and consumer friendly health information. This can be accomplished in the form of inspiration guides, cookbooks, videos, social media, and video. Nutritionist and product development expert Mona Dolgov lives her lifelong mission of creating healthier food products and inventing simple culinary tricks to create yummy recipes. A graduate of Cornell University in Nutritional Sciences (Nutritional Biochemistry), and an MBA from New York University, she has worked in the housewares and food industry for the last 20+ years, inventing patented food-related products, and launching marketing programs for healthier living. 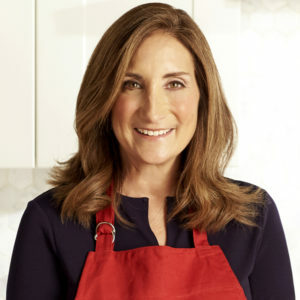 She also has authored and published over 20 cookbooks for housewares manufacturers and grocery retailers, focused on simplicity and using nutritious ingredients. She recently co-authored The Perfect Portion Cookbook, a 5-star rated cookbook that makes American classics healthier and guides consumers to healthier portion control. Our team of product development experts, nutritionists, professional chefs, designers, writers, strategic marketers, photographers, and printers make it turnkey to create cookbooks and recipes fast and effectively. Want to learn more? Let’s talk and share! Fill out the email form below and I will contact you. © 2018 You Live Right, All Rights Reserved. Design by Quench!